Salaw machu kreung, pickled fruit, papaya salad, beef skewers, chow mein, Thai tea, and more are available at the Oakland takeout spot. Best of all, everything on the menu is affordable. There’s a new spot in The Town to pick up Cambodian street food — and it’s aptly named Cambodian Street Food. Owner Malinda Bun, along with her mother Mach, opened the tiny takeout spot on Nov. 3. Bun wanted to showcase her mother’s cooking and make it available to the community. “Cooking is one of [my mother’s] passions,” Bun said. “She’s been serving at temples every time it’s a traditional occasion. 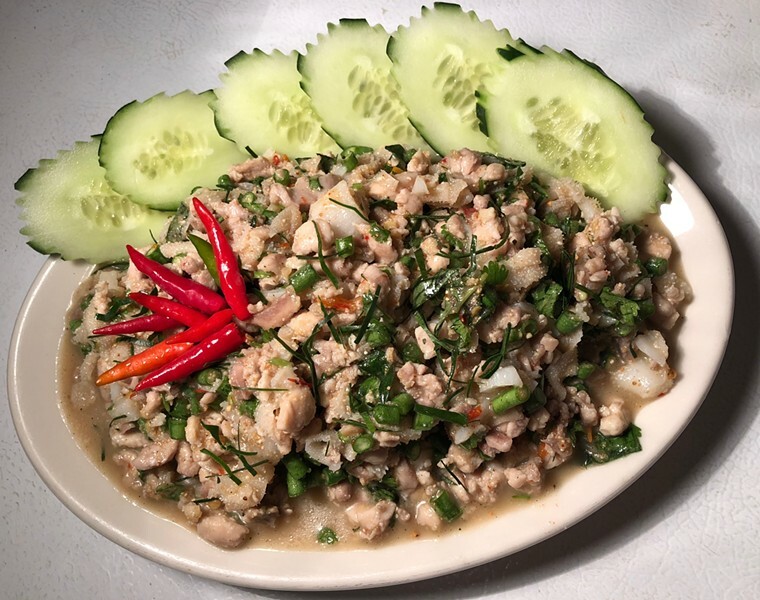 … She’s known to make really good food.” There’s a selection of traditional Cambodian dishes that her mother makes, along with a few dishes that Bun describes as “fusion.” And best of all, everything is affordable — most dishes clock in at $10 or less. On the more traditional side, one of the top sellers is the salaw machu kreung — a sweet and sour soup made with eggplant, lemongrass, beef, and tripe. There’s also chicken chakreung, a soup made with lime leaves, bell peppers, string beans, and lemongrass. Another popular traditional favorite is the steak with prahok sauce. Here, slices of grilled steak are served with prahok sauce, made of lime, baby eggplant, fermented fish, and red radish to create what Bun describes as a sour taste. The proper way to eat it, according to Bun, is to wrap the steak in lettuce leaves along with slices of cucumber, then dip the wrap into the prahok sauce. There are even some traditional snacks. One enticing option is the pickled fruit. Here, pickled baby grapes, guavas, and mangoes are served with a dip of sea salt and Thai chili peppers. On the less traditional side of things are dishes like chow mein, fried rice, and egg rolls. But there are also some dishes people might not typically think of as Cambodian, though Bun said you can find those dishes in Cambodia, too. One of her favorites is the papaya salad. There’s also larp, made with toasted, crushed rice and your choice of chicken or beef, then topped with fermented fish sauce. It’s served with fresh basil and lettuce for wrapping. There’s also banh xeo — eggy, savory crepes stuffed with onions and bean sprouts, served with lettuce on the side for wrapping, a sauce made of fish sauce, vinegar, and brown sugar for dipping, and optional crushed peanuts to top it off. Wash it all down with a Thai iced tea. There are also some rotating weekend specials like amok, a steamed curry made with fish. To get updates on the weekend’s specials, you can follow Cambodian Street Food on Instagram @cambodianstreetfood. Cambodian Street Food is at 2045 Foothill Blvd., Suite B. Hours are 11 a.m.-7 p.m. Wed.-Mon., and the shop currently accepts cash only.